In modern science, the prevailing opinion supposes that whatever falls into a black hole disappears forever and breaks apart into the component parts. However, a new theory states that black holes do not destroy the matter but rather are a kind of exit gate which lead to other universes just like our own. The new theory was developed by Jorge Pullin of the State University of Louisiana and Rodolfo Gambino of the University of the Republic of Uruguay. The two scientists decided to study the predictions of the theory of quantum gravity in black holes. More specifically, they applied the equations of quantum gravity in a non-rotating black hole with spherical symmetry. 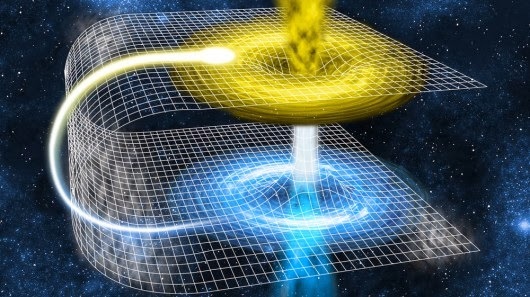 As described in other theories, as the matter approaches the core of the black hole, the gravitational field becomes more and more powerful, but it does not disappear into a spacetime singularity as the prevailing theory states. According to the study results of the two researchers, the matter does not disappear in the middle of the hole but continues its way up the other end and into another universe. According to the new equations, the matter black holes absorb and seemingly destroy is actually expelled and becomes the building blocks for galaxies, stars, and planets in another reality. Essentially, every black hole contains a smaller alternate universe. And our universe might just exist inside a black hole of a galaxy in a much larger universe. So within the 100 billion galaxies in our known universe lies 100 billion universes in the galactic black holes of our universe, with 100 billion more galaxies each containing another universe with more galaxies, and so on infinitely. So the idea that black holes are portals to other worlds rather than a place of absolute destruction is not new. But they all stumbled on the spacetime singularity. This is the first time when this barrier is bypassed with the help of scientific tools. The results of the study were published in the journal Physical Review Letters. Furthermore, a recent study published in the scientific journal Nature shows that our entire universe may have been born out of a black hole from another universe. In other words, the Big Bang was really just an extension of a black hole in a different universe.